Our retail facility is open to the public all year. Hours of operation are Tuesday thru Saturday, 9-5. However, seasonally our hours change. So before heading our way, please call ahead to confirm current hours. 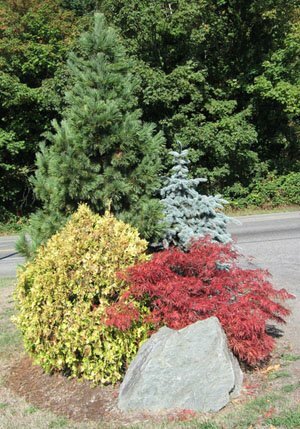 We of course offer a large selection of our grafted conifers but also offer great selection of Japanese Maples. Our maple selection is in house production offering many varieties difficult to locate. The retail facility specializes in our conifers. Perennials and bedding plants are not among the product line, nor nursery or garden hardware. Simply, if you are looking for material to set your landscape in motion or that certain plant for that singular location, Wells will meet your expectations. On site consultation services are available with design referrals for both commercial & residential needs. The retail staff has over 34 years of combined experience. This knowledge offers our retail customers solid, accurate and honest information for all plant landscape applications. From deer tolerant material for our San Juan Islands customers to drought tolerant material in other locations, the retail staff is more than happy to discuss your needs. Located just off I- 5 at exit #226 in Mount Vernon our destination is for all horticultural enthusiasts. We invite you to our retail nursery or call for more information. We look forward to seeing you.